I value very much the support and friendship that I have with my Partners, many of whom have been with me since my earliest days as a Professional. I appreciate their loyalty to me throughout the years and am proud to represent their brands around the world. I look forward to the future together. I would like to introduce them to you. In golf precision and excellence are essential in order to achieve results. Audemars Piguet watches have that in abundance, coupled with style and elegance, and when I wear my Audemars Piguet I am aware of the amazing craftsmanship that goes into every tiny detail. I am very lucky to have some beautiful watches from Audemars Piguet and I just picked up my latest watch, the Royal Oak Perpetual Calendar in pink gold. It's beautiful ! Anyone who is familiar with me, will know that I love performance cars and if I hadn’t been a professional golfer I would love to have been a racing driver. I am living these days in Vienna, and BMW Austria have very kindly provided me with a fantastic BMW 640 X-Drive Coupe. When I am in Spain I drive my beloved Ferrari 550 Maranello that I bought in 1999 after my first big tournament win and I also have a Mini Cooper Countryman, which is great fun to drive. My key requirement when choosing golf clothing is to select the highest quality cotton shirts. My tournament schedule takes me to many different countries and climates, so it is vital that I feel comfortable at all times on the golf course in order to give me the confidence to both play and look my best. Bobby Jones offers me the best range of apparel to suit all conditions as well as a great selection of styles and colours. You may have noticed that I wear some really amazing belts. These have been made by Elliot Rhodes, a family business based in London. The belts are handcrafted from the finest calf leather sourced from Spain and Italy and the buckles are individually designed and can be inter-changed to different belts. I love their unique styles and the fact that they look great with golf clothing or with jeans. Marketing and Management International is the management company that looks after all aspects of my career on a worldwide basis. Our business relationship now spans more than 20 years and the Company plays a very important role in my career. Sarah Phillips and Jeremy Ward are an integral part of my Team as a Professional Golfer. When I had the chance to test the Maui Jim sunglasses, I was impressed by the clarity of the lenses, and their ability to improve what I see on the course. Maui Jim has been voted favourite sunglasses company and best sunglasses by optical retailers and many of the top health, fitness and outdoor sports media around the world. My favourite pair are the Maui Jim Mavericks. I became the Global Ambassador of Mitsubishi Electric in January 2015 and I am very proud to be the global representative of this world leader in the manufacture of electronic equipment. I am wearing the company’s logo on my clothing and taking part in various community activities around the world, as well as playing the Mitsubishi Electric Championship and Mitsubishi Electric Classic on the PGA TOUR Champions. I look forward to continuing to work with this great team of people. Wearing a comfortable pair of golf shoes that also give me the stability and support I need is absolutely vital in my profession. My golf shoes are hand made by Gigi Nebuloni near Milan, Italy, using artisan techniques that have been passed down from father to son. Made from the finest calf skin, I usually order about six pairs a year in my favourite designs and after a partnership of over ten years with Nebuloni, you can imagine I have quite a few pairs at home! They are perfect and fit me like a glove. An amazing product and a loyal Partner for over twenty years and fantastic friends! I have played PING golf equipment throughout my professional career and I have to contribute a great deal of my success to PING and the Solheim family. 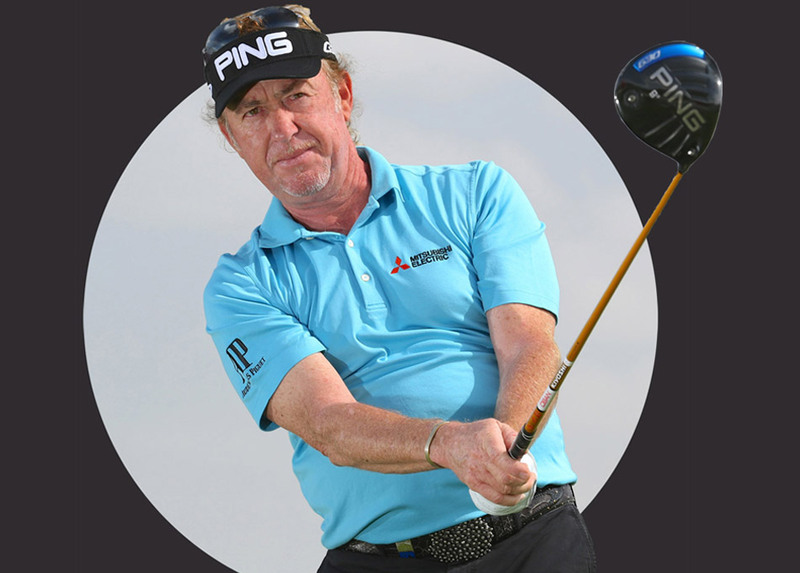 In addition, PING has installed a Fitting Centre at my Golf Academy in Torremolinos, near Malaga, Spain, and this forms a significant part of the excellent facilities on offer to visitors to the Academy. Another of my long term Partners, I have been playing the Srixon golf ball and wearing their golf glove for many years. I am using the Z Star ball at the moment which I find extremely consistent. I like to shape my shots and I find the Z Star helps me to execute whatever shot I want and it also has great performance in the wind. On average I use about six golf balls during a round. I also wear the very high grade Srixon cabretta leather glove which I find very comfortable, soft and flexible and I use a new glove every day.